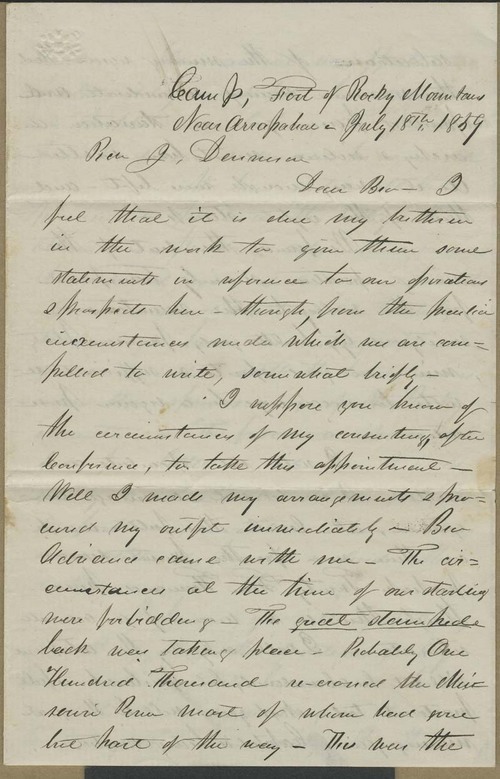 William Goode wrote to Joseph Denison from a camp at the foot of the Rocky Mountains. Goode described "forbidding" circumstances at the start of their journey West, having met a "great stampede" of settlers returning East. However, upon arrival at the mining operations, Goode found the settlement orderly, provisions plentiful, and the landscape beautiful. Though he hesitated to speculate, Goode predicted that the following year would be prosperous for mining enterprises.